Mount Sinai Medical Center has completed a $275 million expansion with a new patient tower and emergency department. The nonprofit hospitals in Miami Beach is now all private for its 400 rooms. This will be a major help in attracting patients, welcoming visitors to patient rooms, and keeping people safer, said MSMC President and CEO Steven Sonenreich. The new hospital wing will open to patients on Feb. 2. A ribbon cutting was held Jan. 25. With about 350,000 square feet of new space in the hospital, MSMC also ramped up its hiring. It added over 200 people, from clinical staff to operational support positions, he added. “This is an enormous amount of capital deployment and it is having a big impact on the community,” Sonenreich said. 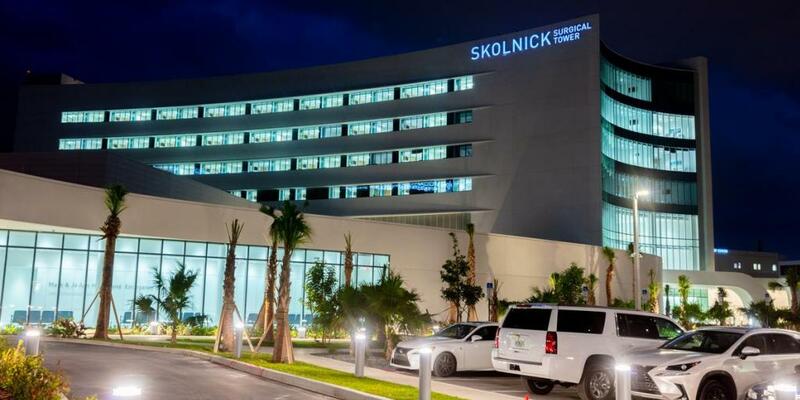 The new Skolnick Surgical Tower has 12 operating rooms and 154 patient rooms. The new operating rooms are equipped with the latest surgical technology and have enough room to accommodate future advances in medicine, Sonenreich said. There are also monitors so students and medical residents can watch surgeons performing procedures. The new facility was designed to withstand a Category 5 hurricane, and it was constructed at a high elevation to avoid sea level rise and flooding. The new emergency department has 50 patient care rooms. Meanwhile, the old emergency department will be renovated to add another 16 rooms in modernized facilities. MSMC is also rebuilding its kitchen. The architect of the project is CannonDesign. The building features original artwork from Anastasia Samoylova, María Martínez-Cañas, Mark Handforth, Rafael Domenech, Daniel Arsham, and Adler Guerrier. The general contractor was Robins & Morton.